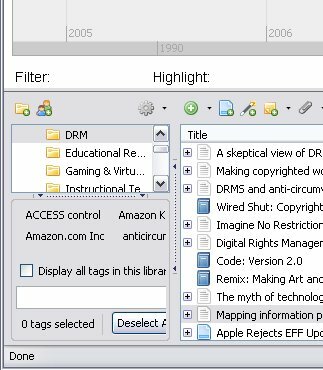 Zotero, the free citation manager for Firefox, has just released a new version that allows you to store attachments like PDFs on their server. This means that you have access to all your PDFs and citations on all of your computers running Zotero. If you’re using Zotero 2.0, update to the latest version and you’ll have a new File Syncing option in the preferences. Just check both “Sync attachment files” options and select Zotero storage (like this). This works with both personal libraries and group libraries. The first 100 megs of storage is free, and Zotero offers inexpensive additional storage options. For more information about using Zotero, check out our Zotero guide or contact Communication Librarian Jason Puckett. We’ll be offering more Zotero workshops online and in the library in spring semester. This entry was posted in For Faculty, For Graduate Students, New Resources, Software and tagged zotero. Bookmark the permalink.